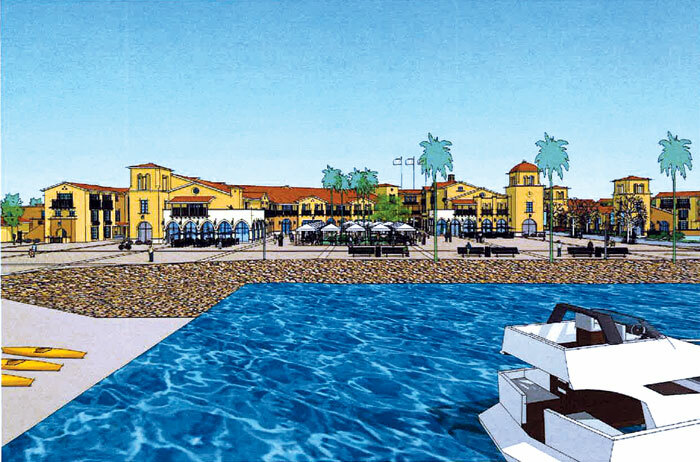 VENTURA — Since the early 1990s, the Ventura Port District has worked to find a feasible way to develop a large vacant parcel of land on Ventura Harbor’s east side, and it has just made a huge leap forward. The 20-plus-acre parcel was rezoned by the city of Ventura in 2007 to accommodate a mixed-use development at the corner of Navigator and Anchors Way adjacent to two hotels in the harbor — the Holiday Inn Express and Four Points Sheraton Hotel. Five years later — after surviving a major recession, a variety of design changes and the loss of his business partner, Douglas Ring (who died in 2009) — Michael Sondermann of Sondermann Ring Partners has been working toward getting the development moving forward. The now-approved plan calls for an eco-friendly mixed-use development that includes a waterside public plaza surrounded by a variety of businesses that will offer a range of amenities. According to the commission’s amendments, the residential development must incorporate 21,000 square feet of ground-floor commercial space to serve both residents and visitors, a harbor water taxi service, bird-safe building treatments and a 50-foot-wide waterfront promenade to improve public access. The next phase is to present redesigned plans and architectural drawings for approval to the city of Ventura. Pena said he was disappointed that the commission has pushed the review of the waterside (marina) development plans to a commission session sometime this summer. “We were disappointed that the commission pushed back the review of the waterside development plans — possibly in July in San Diego, where the commission will hold its next regular session,” Pena said. The waterside part of the plan includes building a new marina with 104 recreational boat slips averaging 40 feet in length to include covered parking structures and amenities for boaters, such as showers and restrooms. The new marina will be operated by Sondermann Ring Partners. “This developer has excellent experience and a great track record for marina development and operation in Marina del Rey. Even during these tough economic times they have been able to maintain successful marinas,” Pena explained. After project completion, revenues from the port district to the city of Ventura can increase as much as $300,000 annually or more.